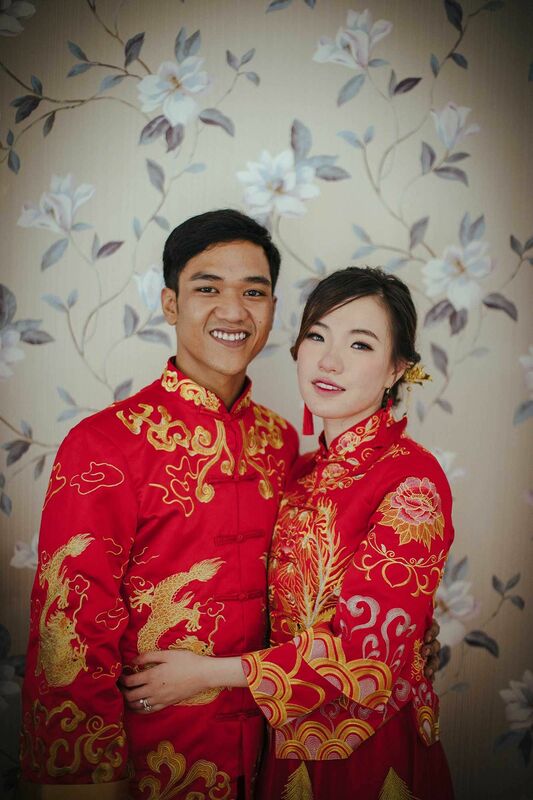 Financial consultant Rizrin Shah and lifestyle influencer Pearl Tan honoured their respective Malay and Chinese cultures by including customs such as the akad nikah, jip san leong and tea ceremony into their wedding celebrations. The couple's wedding celebrations first started in September 2018, but due to a sudden illness in Rizrin’s family, the groom's reception was only held two months after. Thanks to the speedy recovery of this family member, there were smiles all around at the couple's final wedding reception at Mandarin Oriental KL. The groom's parents Dato’ Sri Anuar Abd Aziz and Datin Sri Nasimah Mohd Yusoff stood first in the greeting line to welcome guests like Zaireen Azman, Datin Sri Dottie Kamaluddin and Dato' Nafsiah Abu Bakar. At 8pm sharp, Rizrin and Pearl made their grand entrance to rousing kompang beats. The highlight of the night was a spirited Malay dance lesson courtesy of the emcee for the night. Rizrin serves tea to his parents-in-law, Don Tan and Anna Go. Both the bride and groom wore bridal songket. The couple trying to learn a Malay-style dance.